This historic home built in Phoenix’s Willo District has had many remodels over the years that have strayed from the original Spanish Colonial style. In a previous remodel the kitchen had been enlarged and outfitted with high-quality cabinets. The homeowners wanted to restore their homes historic Spanish Colonial style while keeping most of the original cabinetry. The original tile was replaced with handmade Mexican tile to fit the Spanish Colonial style of the home. The historic style tile is one and a half inch thick, made of concrete and has a unique marble finish – creating the color and pattern. The homeowners wanted to create a more practical space out of the existing peninsula cabinets. We lowered the new peninsula cabinet to table height and fit the mechanics of the downdraft cooktop without losing all of the space inside for storage. 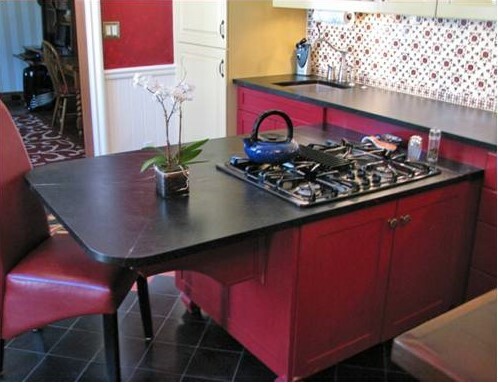 The custom cabinet with a soapstone countertop replaced the peninsula cabinets. The new custom cabinet was designed to have a more appropriate look as well as offer a convenient seating area. We replaced cabinets at the sink base, pull out trash, and peninsula. The previously remodeled kitchen had a non-functional trash compactor beside the sink. We replaced it with a waste basket cabinet. We had the custom soapstone farm sink made out of the same material as the countertops. The new custom sink base was designed to add historic style and set off the new custom soapstone farm sink. We replaced the original black tile backsplash with locally sourced Mexican tile throughout the entire space. A wall alcove was added to create the perfect home for the owner’s new mixer and open up space on the countertop. 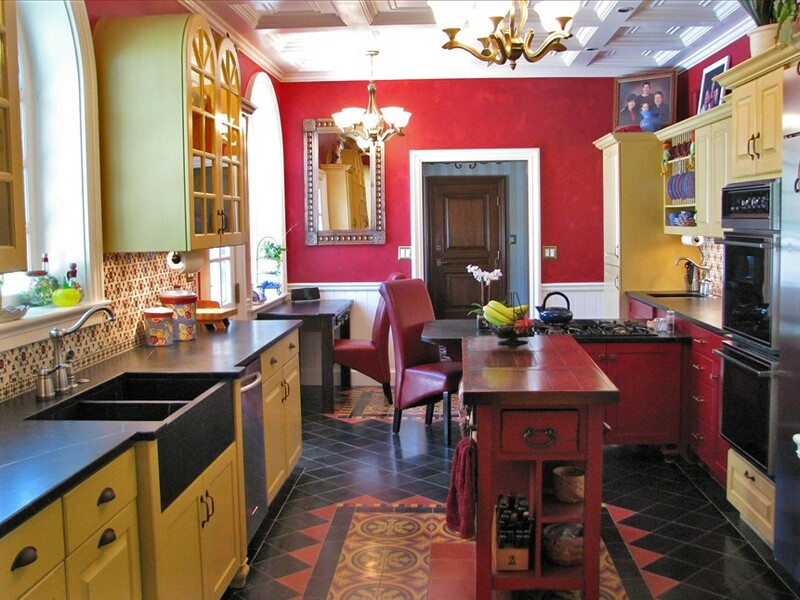 After extensive research of materials and colors that were appropriate to Spanish Colonial homes of the home’s age and location, we were able to transform a once plain and simple kitchen into a colorful work of art. With custom made marble finish tile, black Soapstone countertops, a custom Soapstone sink, custom wall texture, and bright cabinets, this kitchen remodel in Phoenix is guaranteed to wow any and all guests.